Earlier Tuesday, the index tanked as much as 2.8 percent to trade 10.7 percent below its all-time intraday high. The Nasdaq recovered to close just 0.4 percent down. Major tech companies had accounted for nine of the top 10 stocks weighing negatively on the Nasdaq at its lowest point during the session. Traders work on the floor of the New York Stock Exchange (NYSE) in New York, U.S., on Wednesday, Nov. 9, 2016. 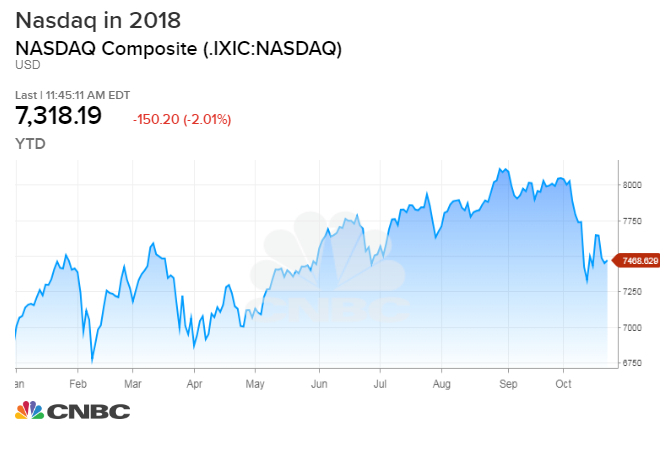 The Nasdaq Composite climbed out of correction territory late Tuesday, as major tech stocks recovered from an earlier rout. Earlier Tuesday, the index tanked as much as 2.8 percent to trade 10.7 percent below its all-time intraday high of $8,133.30, hit on Aug. 30. At one point, the composite was down 8.3 percent month-to-date, on pace for its worst month since November 2008 when it shed 10.8 percent. Major tech companies had accounted for nine of the top 10 stocks weighing negatively on the Nasdaq at its lowest point during the session — yielding only for Pepsi to slip in among the biggest losers. At 11 a.m. in New York, Apple and Facebook were each down 2 percent, Amazon and Microsoft were each down 3.5 percent, and Google parent Alphabet was down 2.2 percent. By market close all of those stocks had pared their losses. Jeremy Klein, chief market strategist at FBN Securities, noted the tech sector's been out of favor for several weeks, as managers take profits ahead of year's end and brace for another tech earnings season. Amazon, Intel, Alphabet, Twitter and Snap all report quarterly earnings later this week, followed by Facebook and Apple next week. Last quarter saw major market moves for tech companies, as quarterly results pretty consistently disappointed. But compared with industrials — which was dragged lower Tuesday by Caterpillar and 3M earnings — Klein said, the tech stocks weren't the problem.